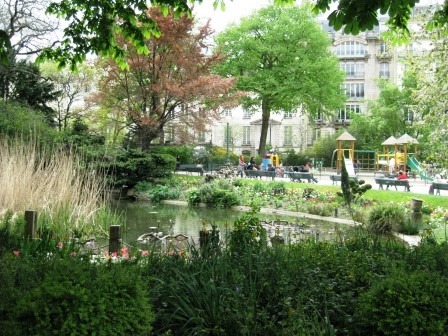 A delightful oasis in Paris, Square du Temple. My first inclination when I started to plan this long-awaited, extended time in Paris was to narrow my apartment-searching to my old stomping grounds. The Left Bank. The 5th, 6th and 7th arrondissements. As noted in this earlier post, it’s where I’ve spent by far the most of my time in Paris. That first study program in 1984, we spent most of a month in a hotel on the rue des Ecoles in the heart of the Latin Quarter. Which ended up being my home base the following year when studying in Dijon, for those many weekends I hightailed it up to Paris after classes ended Friday. Four years later I returned again to the Left Bank to go to La Varenne cooking school, located in the swankier 7th arrondissement, near the Senate and other goverment buildings, and the glorious Les Invalides esplanade. In the couple decades since, passing through Paris as a tourist, I’d been staying at the charming Hotel des Marronniers in rue Jacob in the heart of the 6th, steps from rue de Seine, Boulevard St Germain and other Latin Quarter draws. Aside from about 6 months in an apartment near Sacre Coeur in the early 1990s, I’ve pretty much laid my head down every night on a pillow to the south of the Seine. After a couple weeks last year considering options for this trip, it dawned on me: I was returning to Paris this time to not just retrace previous steps but to get to know the city better. Get out of my ruts a bit, not fall back solely on the familiar. So I ditched the Left Bank in favor of the Right. And after nearly a week here, couldn’t be happier. I’m in the Marais district which, yes, is popular. The gorgeous Place des Vosges (dating back to early 1600s) is a few blocks away, as is Musée Carnavalet, and lots of great shopping & eating streets among other attractions. But it’s a fraction the tourist-intensity of the islands (Cité, home of Berthillon, and Louis, home of Notre Dame, Ste Chapelle), Place St Michel, Odéon and all that on the other side of the river. One of the more unique things on this side that I had never visited in all previous trips here was the Canal Saint-Martin, just a 10 or 15 minute walk from here, in the 10th and 11th arrondissements. On May Day we had a lovely morning stroll along the canal, happened upon one boat making its way up the canal, so got to see the locks in action. Which, for a Seattleite having visited the Ballard Locks more than a few times, is familiar mechanics. 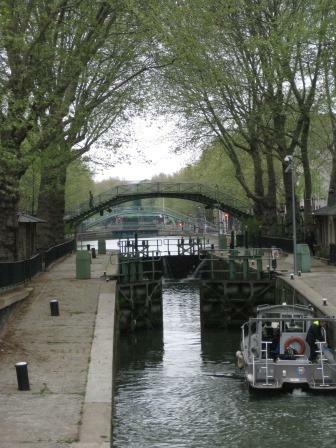 But given the canal has multiple groupings of locks along the way (unlike Ballard’s single one-step-up/down connection), I had to laugh when I realized that this Paris canal reminded me of the Panama Canal in miniature. The Panama Canal doesn’t have any cool swinging bridges for cars, though. There are a couple roadways that cross the canal just above water level (i.e. no elevated bridge), the canal-topped portion swings to the side when needed to let watercraft pass through. There are a number of dramatically arched pedestrian bridges, artfully embellished with wrought iron. Much of the canal’s 4.5 kilometer length is exposed, but from near Place de la Republique to just before that last lock lowering boats to the Seine, it passes underground. Didn’t know much at all about the canal, but just read up a bit. It was commissioned by Napoleon at the turn of the 19th century to bring drinking water to Paris from the Ourcq river to the north. Apparently it was paid for by a new tax on wine, which is rather appropriately ironic: drink more wine, French citizens, so we can afford to bring you fresh drinking water! Back to the Panama Canal for a second, did you know that it was actually the French who first started design and construction of the canal? They did a lousy job of it, both in terms of the design approach (in large part because of a project director who had very little experience at all, let alone with a challenge the scale of crossing Panama) and disregard for worker well-being (about 22,000 people died working on the canal in the decade or so the French were in charge). After they foundered and went bankrupt, the project was stagnant for a while before the Americans got on board. But whoever was in charge of this Saint-Martin canal did a GREAT job. And let’s just focus on that for now. 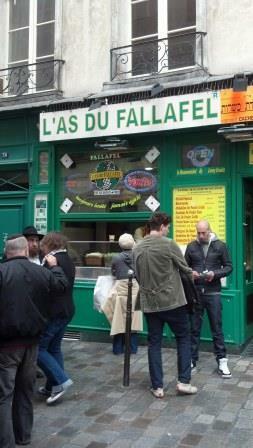 A specialty of the Marais: falafel. Will definitely get back for a taste of these. So I couldn’t be happier with that decision to jump across the river and spend most of my time this month in parts of Paris I know less well. First afternoon we happened upon the Square du Temple, a lovely park complete with pond and baby ducklings. Rue de Bretagne is ideal for food shops, cafes and the small but interesting network of food stalls in the Marche des Enfants Rouges. The rue des Francs Bourgeois has some great shops of all sorts, including this cool outpost for knitters/sewers/crafters of all types. It’s not overflowing with yarn like most knitting shops but has patterns, accessories and plenty of items (along with some yarn) that would inspire any number of projects. After a quick look-see visit I’m sure I’ll be back with more serious intentions. I’ve got a few more weeks to soak things up, get more connected with these newer-to-me parts of Paris, which I’m very much looking forward to. As I said in that other blog post, there will be some doses of nostalgia in my daily wanderings. But mostly this trip is all about new explorations. So, with that, off to explore some more today. Hi! I was sent to follow your blog by Kathleen Bauer. Paris? Food? Love it! We stayed in le Marais last fall, and had a great time. 10 years before, we stayed near the Luxembourg Gardens. I hope it’s not 10 years before we visit again. I didn’t know about the Canal St. Martin, and now I want to go see it. Great to hear from you, really loving the Marais, a great change of scenery and vibe. Thanks for the lead on La Droguerie, like I need any yarn right now. Brought some home for small projects while over here and have barely gotten through a few rows. Paris is kinda distracting that way.